Ready to build your shed? Just wondering what roof to build and how it all goes together? Where to start? Don’t worry; we’ve all been there. Angles, lengths, slopes, they’re all part of the roof design and build. To make it easier, we’ve put together a how-to DIY shed roof framing guide with step by step guide for some of the more popular shed roof designs. We’ll give you some tips and tricks to make your build easier and help understand some of the building terms too. So, pour yourself your favorite beverage, sit back, and enjoy our little guide. Hopefully, we answer all your questions. Plywood or OSB is the most common materials used for the roof sheathing. It must meet the local codes for thickness (at least 3/8”), which is also based on the rafter or truss spacing. The pitch of the roof determines the roofing material you can use. Asphalt shingle can be installed on a pitch of 2 over 12 or greater. There are special shingles available for 2/12, but you’re better off using other materials. If the roof is less than 2/12, it should be either metal or have a rubber membrane covering it. You’ve put a lot of sweat and money into building your shed, so protect your investment by using felt paper, ice guard, and drip edge. They may not be necessary on a shed, but they will help the roof last longer and help protect whatever you store in the shed. Where you’re building has an impact on roof slope and design. Snow load, wind force, rain and heat all are climate factors that influence the roof. Most roof designs can be made to work in most climates, just be aware that there may be higher costs involved to build them. The greater the snow load potential, the higher the slope should be (4/12 or better). Rain can pool on a low slope roof and rot cedar and asphalt shingles and find or enlarge gaps to cause leaks. Damp shingles can lead to moss which will also rot the shingle. A strong prevailing wind or gusts usually means a lower slope windward to reduce wind force. The saltbox roof was designed for coastal winds. Hot, arid climates frequently have a low slope roof design with lots of ventilation and insulation. Different roof styles go with specific structures. If all walls are the same height, the Gable, Hip, and Gambrel roof works well. If you want a high side and a low side, the Saltbox, Skillion or shed roof is for you. If you need a high usable attic/storage space, the Gambrel or barn roof is best. If you want headroom or storage on one side but not the other, the Saltbox is ideal. The Gable or Hip roof will give higher center storage or headroom. The Skillion or Shed roof provides a single slope roof deck running from a high wall to a lower wall. The slope determines if it is a Skillion (greater than 6/12) or Shed roof. It permits high storage on one wall and less on the other. Measures the rise in inches for every foot of distance horizontally: 3” rise for a 12” run (3/12). Is the height of the roof compared to the total span of the roof, usually expressed as a ratio of in feet (6-feet to 18-feet or 8:16). The span is the distance from one rafter supporting wall to the other rafter supporting wall. Is used to cut the rafter where it meets the ridge beam, and to cut out the birds mouth at the wall. It is measured from the horizontal wall line to the sloped rafter using the rise over run: a 14° angle gives a 3/12 slope, 4/12 is an 18.2° angle, and 6/12 a 26.6° angle. The upper edge where two roof slopes or decks meet. Transfers the roof load to the gable ends or a post and supports the rafter ends at the ridge. It can be under the rafters to support, or the rafters can tie into it for support. Is a plank that supports the top end of the rafters, maintains spacing, and helps the roof structure to work as a connected system. A horizontal plank that helps hold two opposing rafters together, and thus the roof; often located 1/3 to 1/2 down the rafter between the ridge and the ceiling. Is a cut notched into the rafter where it rests on the top plate of the supporting wall; it helps transfer the roof force to the wall and makes it easier to securely toenail the rafter to the wall. Is the distance from the ridge beam to the wall, it is calculated using the total rise over the total run (Pythagorean Theorem). If it has an overhang, that is added after calculating the rafter length. A roof can usually withstand more than its rated snow load based on the tributary area, duration, and inertia. The closer the rafters are together, the thicker their depth, the use of collar ties, and the greater the slope, the better able to withstand snow load. Additionally, the greater the slope, the greater the impetus (gravity) for the roof to shed the snow. The tributary area is the maximum distance between the rafters: 12-inches means 6” tributary area, 16-inches is an 8” tributary and 24-inches is 12”s of tributary area. The greater the distance between the rafters, the greater the snow load each rafter carries. The duration is the length of time the snow stays on the roof before it melts, evaporates or slides off; it is usually brief, so there is less damage than if it was year-round accumulation. The inertia is based on the time it takes for the snow to accumulate on the roof. The moment of inertia is great, since the snow build up is over a matter of hours, days, or even weeks. So the roof has time to adjust to the load. The pitch measures the height of the roof, its total rise, compared to the total distance the roof covers from side to side, or its span, in feet. It is a ratio. If the ridge beam or peak is 6-feet above the horizontal wall height; that is the total rise. The span is the total distance from one rafter support wall to the other rafter support wall; usually, double the run of the rafter. For example, if the rise is 6-feet and the span is 24-feet, the pitch is 6/24 or 1/4. The slope is a ratio of the rise over the run of a rafter, usually measured in inches or as a fraction. The distance horizontally from the support wall to the centerline under the ridge beam is the run. The distance vertically from the top plate to the top of the ridge beam is the rise. It compares the distance up in inches for every horizontal foot or run. A 6-inch rise over a 12-inch run is a 6/12 slope. The pitch is more relevant to the construction of the building and calculating material needs, and the slope to the roof construction. There are 3 main types of roofs; flat, low slope, and steep slope – a Gambrel is a combination of a low and steep slope. Flat Roof – has a slope of 2/12 or less, it is usually covered with metal or a membrane. Very little to no wind force, but very slow to shed snow or rainwater; may require a special drainage system. Low Slope – has a slope between 2/12 and 4/14, is usually covered with rated shingles or steel. Less wind force impact, but sheds snow, rain, and debris slowly. Steep Slope – has a slope greater than 4/12 and is covered with shingles or steel. It needs to withstand greater wind force but sheds rain, snow, and debris more quickly. The Building Code highlights acceptable materials for different roof slopes, styles, and climates. It details all factors in roof construction, even ventilation. It doesn’t address drip edge though. Building code also details requirements for areas with significant snowfall. It often includes requirements for a steeper roof slope. You may need to get stamped engineered truss drawings too. Or, you may require thicker timber material for truss/rafter construction. Some areas include ground level to eaves height requirements too. The impact on neighboring structures or properties is often also a consideration. It’s best to check with your local building department before you start. Make sure your structure meets code requirements. Rafters and trusses are both used to build the roof structure. The main difference is a truss is built in a factory to engineered standards. It often uses smaller members to form a web of support triangles. A rafter is usually made on the job site using thicker dimension lumber. Cuts for tying to the ridge beam and birdsmouth for the wall are individually done, and collar ties added. 2×6 or larger planks that are angle cut to meet flush with, or above, a ridge beam that runs the length of the roof. They also usually have a birdsmouth notch, so they hook onto the top-plate of the wall. Extend across the low wall top-plate over the high wall top-plate. They are often notched at both walls and extend past the supporting walls to form the eaves. They are usually 2×6 planks but may be thicker depending on slope, snow load, and span. Are usually manufactured to engineering standards. They have a diagonal top member that forms the roof slope, and a bottom member the runs the roof span. The top and bottom are connected by smaller pieces that form connecting triangles. The triangles transfer the load from the roof deck to the walls or supports. When to use trusses and when rafters? Use rafters for smaller span projects and trusses for wide span projects. Rafters are better for an open attic space or a vaulted ceiling and don’t have to be pre-ordered. Rafters historically spanned similar distances to modern trusses, but today the main factor is cost. Calculate the material cost to build a roof using rafters, then give a truss company (or two or three) a call and get a quote for the same roof done with trusses. Remember to factor in the cost of delivery and a crane to lift the trusses to the roof (if required). The further away from a truss manufacturer and a crane you are, the greater the cost, so rafters may be a better option. What is best, rafters or trusses? Depends on what you are building since the structural integrity of a properly built rafter is the same as a truss. Trusses have been replacing rafters because they can cover wider spans more easily. They often cost less since they are made of smaller dimension lumber than a rafter. Since trusses are assembled off-site they arrive ready to install which saves time. However, they must be ordered weeks and sometimes months ahead of time. Rafters are great for sheds or garages, or even small additions to a house, and don’t need to be ordered in advance. Which option is faster and safer? Rafters are faster for small projects. However, for large buildings, pre-ordered trusses arrive at a set date and can be installed in a day or two. Rafters for the same project could take skilled carpenters weeks or months to erect. Both trusses and rafters are safe for roof construction. However, safety is a matter of human knowledge, planning, and error. Rafter length and weight may be easily handled by one person on a shed. But a truss for a house may require 2 or 3 workers or a crane. Not bracing the walls or putting your hand or foot in the wrong spot is human error; knowledge and planning prevent errors. A gable roof for a shed can be built with rafters with a 1×6 ridge board or using trusses. Much depends on the structure size, and the desired attic, loft, or headroom. A simple gable shed roof is often built using 2×4 or 2×6 lumber for the rafters, and 2×4 for the collar ties. The rafters are angle cut at the ridge end and notched with a birdsmouth where it meets the top-plate of the supporting wall. Building trusses on site is easily done for a shed. The rafters are angle cut to meet each other instead of the ridge board. The ceiling joist spans from support wall to support wall and sits on the walls. It is angle cut where it meets the rafters. Use triangles or squares gussets cut from ½” thick sheathing to attach the 3 truss pieces together. Remember to extend the rafters past the walls for the eaves, and to cut the ends to be parallel to the walls for the facer to attach. A Gambrel shed roof involves significantly more angle cuts than a gable roof but provides more storage space in the attic. It’s much easier to make your own trusses than to build the rafter system, or even purchase ready-made trusses. To make your own trusses angle cut the 2×4 pieces for the upper slope to the desired length. Then cut the lower slope 2×4 pieces, so they connect with the upper piece and run to sit on the top plate. Make triangular gusset plates using ½” plywood to attach the 4 pieces to form the truss. A 2×4 or 2×6 (or heavier) ceiling joist connects the bottom of the truss where it sits on the top plate. The dimension of the ceiling joist depends on the span and what you plan to store in the attic. The Saltbox shed roof is constructed similar to the gable roof, except one roof slope is longer than the other because the support walls are different heights. The ridge is off-center and closer to the taller wall. Rafters are angle cut to meet at a ridge board, and birdsmouth notched where they intersect with the support walls. The collar tie often connects with the short section at the top plate and then runs horizontally to the long slope piece. Most pieces are made with 2×4 or 2×6 lumber. The Skillion and Shed style roofs are framed with a single slope 2×4 or 2×6 (or thicker) rafters spanning from the low wall to the high wall. 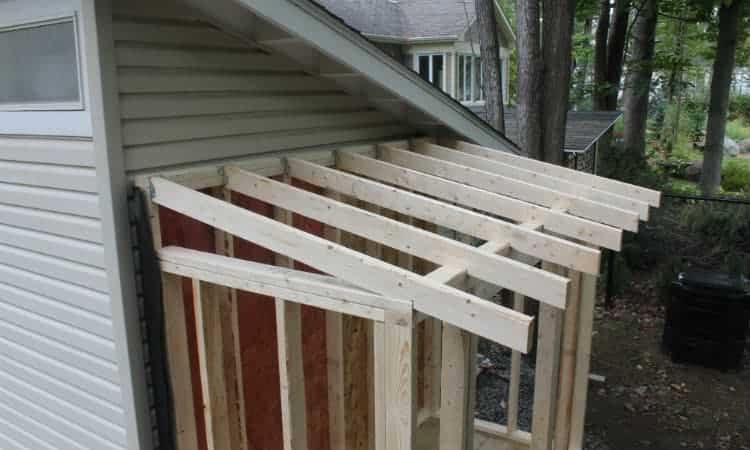 If you plan to have eaves to protect the shed walls, make sure you add the extra length when measuring the rafters. I prefer to notch a birdsmouth where the rafter sits on the high wall and the low wall and extending it at both ends to form eaves. I also cut each end vertically for the fascia board, and block or strap the rafters to prevent twisting under snow load. A lean-to roof just means it’s attached to an existing structure. The high end of the rafter sits on or attaches to a ledger plate attached to the existing wall. The lower end is done the same way a Skillion or shed roof is. Notch a birdsmouth where it sits on the low wall and extend it past the wall for the eaves. A hip roof sheds snow, rain and leaves well and can be made with trusses or rafters. When using rafters, common rafters are attached to a shortened ridge board which doesn’t run the full length of the building. Cut the ridge end with an angle cut, and at the supporting wall top plate with a birdsmouth notch. A common rafter usually runs from each end of the ridge board with the same angle cut and a birdsmouth where it sits on the end walls. Four hip rafters are angle cut to fit between the two perpendicular common rafters at the end of the ridge board. The lower end is notched to sit better on the corner of the two walls. Shorter rafters, or jack rafters, are angle cut to attach to the hip rafters and notched for the wall. All rafters are equally spaced at 12”, 16” or 24” centers. Although there are a lot of angle and birdsmouth notches to cut, it is a fairly simple, but attractive roof. A flat roof has a slope of 1/8” per foot to 2/12. It is not ideal for snow or heavy rain, but modern materials and proper drainage have helped. If you build a flat roof, try to have it slope in multiple directions to drains or gutters; think of a flattened hip roof. Due to the stresses or weights involved, it’s a good idea to check with the local building department. Also, use thicker building materials if recommended. Framing a shed roof is similar to framing a wall. The fascia board is the bottom plate and the ridge board the top plate. Keep it simple and remember; it’s a shed! Stick to the basics of simplified design and use dimensions that don’t generate waste. Sheathing comes in 4×8 sheets, and dimension lumber in multiples of 2-feet. Most even dimension sheds are perfect, even if you want eaves all around. You may need to rip a 4×8 sheet in half, but minimal waste means less expense. Building trusses or cutting rafters for a garden shed is fairly easy. If it’s a barn or garage, then cost out manufactured trusses. Lay out your rafter or truss design and determine the angles, birdsmouth, or gussets needed. Cut a pattern piece or pieces, check the fit, then cut, build, and frame the roof. Construction accidents occur in the thousands every year. Whether stepping on a nail, twisting when carrying a load, trimming a finger with a skill saw, broken bones falling off a ladder, or roof surfing on wet sheathing and not surviving the impact. Most accidents are avoidable and are usually just human carelessness. Ladders make reach rafter or truss heights easier and safer. Tie the ladder off, use standoffs to stabilize it, make sure it’s on solid, level ground, and don’t overreach. Safety glasses are a must on a building site. Sawdust, nail fragments, and flying debris are some of the hazards you need to protect your eyes from; a cheap way to minimize risk. Safety footwear is always a good idea. Sandals or runners maybe light and comfortable, but step on a nail or kick a truss into place, and you’ll feel it. Work gloves protect from slivers or cuts, and some even improve grip on nails and wood. Safety rope and harness are a good idea if working on a roof. Make sure you tie it to something that won’t be driving away or where it will be untied because it’s in the way. For building trusses, use 2×4 lumber and make the gussets from ½” plywood. Make rafters from 2×6 lumber or larger, so the birdsmouth doesn’t compromise the rafter. The thicker lumber also makes it easier to insulate should you wish. Multiply the rise in one foot by the total run of the slope. To build a shed roof on a 4’x8’ lean-to shed, I need to know where to attach the ledger plate. The ledger plate is what the rafters will attach to against the existing building. Using the slope, I can calculate how high up from the top of the lean-to walls the ledger needs to be. For a 3/12 slope, multiply the total run in feet by the slope’s rise: 4-feet of run X 3-inches of rise is 12-inches. The ledger board needs to be 12-inches above the top of the lean-to walls. The run is the distance from one supporting wall to the centerline of the shed for a gable roof. For a Skillion or shed roof, it’s the distance from one supporting wall to the other. For the 4’x8’ lean-to in the example in to Determine Rise, the run is the width of the building, or 4-feet. The pitch is the total vertical rise from the top of the wall to the top of the ridge, compared to the total span from support wall to support wall. To determine the pitch of our 4’x8’ lean-to shed example, compare the total rise in feet to the total span in feet, or run in this case. The total rise is 12-inches, or 1-foot and the span is 4-feet, so the pitch would be 1/4, or “a quarter pitch roof”. The greater the roof’s pitch, the better it will shed snow, ice, and rain. It is also easier to insulate a roof with a greater pitch. Asphalt or composite shingles need at least a 2/12 pitch, steel roofing needs a 3/12 pitch or higher, and rolled roofing needs a 2/12 pitch or more. The best pitch for shingles is between 4/12 and 12/12. However, the higher the pitch, the greater the wind force it must withstand. 4/12 to 8/12 is the best. Metal roofing is a good choice for snowy climates. It’s more watertight than shingles, distributes snow load better, metal lasts longer, and it often sheds snow faster – so ice/snow guards might be needed. Darker colors attract solar gain and heat, so helps shed snow more quickly. A common rafter refers to all the rafters that are identical in a specific roof’s construction. Once you make a pattern rafter, all (or most) are cut to match. To find the length of a common rafter, you can use a construction calculator, a free online calculator, or some junior high math involving the Pythagorean formula. The horizontal distance from the ridgeline to the outside of the support wall is the run, in feet. The desired slope is the rise over the run, multiply the run in feet by the desired run, and you have the total rise in inches. Convert so both are either in feet, or in inches, and use the formula and do the math…twice, to make sure. (rise x rise) + (run x run), then find the square root of the combined numbers, and you have the rafter length from ridge to wall. For our 4’x8’ lean-to example, the total rise is 1-foot and the total run is 4-feet. 1×1+4×4=17. The square root of 17 (√17) is 4.123-feet, or 49.477-inches or 49-15/32”+/-. Add the length for the eaves, if needed, to the rafter length, and you have the overall length of your common rafter. Remember, you need to add for the ridge angle cut plus the thickness of the wall when selecting the length of dimension lumber to use. To determine the lumber size and O.C. Spacing I use Rafter Span Tables. For most sheds less than 20 feet wide with a 3/12 gable roof, 2×6 at 16-inch centers works, and that’s with a 40-pound live load. If your rafter length is less than 5-feet, use a 2×4 at 16-inch centers. The 4’x8’ lean-to example could use 2×4 rafters at 16” centers since they are less than 5-feet long. The length of material would be determined by the overhanging eave. The birdsmouth should sit on the wall not exceed 1/3 of the depth of the rafter if it extends past the wall. The code usually requires a minimum of 1½” of the rafter sitting flush on the wall. Use a framing square to help lay out the notch based on the slope of the roof. A 2×4 wall with a 2×6 rafter can be notched for a 4” seat. For our 4’x8’ lean-to example using a 2×4 rafter, the depth of the birdsmouth is limited by the 1/3 depth of the rafter rule: so about 1-3/16”. The top plumb cut is made where the rafter will meet the ridge board or the opposing rafter. Use a framing square to lay out the cut based on the roof slope. For a 3/12 slope, align the square so the outside of the short side is against the plank 1/2” to 1” from the end. Pivot the long arm of the square until the 12” mark on the outside is against the plank. Double check that the 3” and 12” marks are at the edge and on the same side of the plank. Draw a line across the plank where the outside of the short arm crosses the plank. You may need to extend the line across the plank. Use a saw and cut at the line. From the top of the angle measure the rafter length as determined using the formula. Mark the rafter at that length. Use the framing square draw a plumb line across the plank at that mark; it should be parallel to the top plumb line. Where the plumb line marks the underside of the rafter, is where it will meet the outside of the wall, and the birdsmouth, or seat, will end. Building codes usually state that you need at least 1½” of the rafter sitting on the wall plate. Align the framing square against the underside of the rafter based on the slope. Move the 12” run arm of the square until the desired seat depth is reached from the plumb line – i.e., 12” – 1½” = 10½” so with the rise and run referenced on the square against the underside of the rafter, the plumb line should intersect the outside of the long arm at 10½”. Draw a line from the plumb line to the 12” run mark, and you have the cut lines for the birdsmouth. The tail of the rafter also forms the eaves. From the birdsmouth plumb line, horizontally the distance for the eaves. Using the framing square at the slope references for the rise over the run on the top of the rafter, measure from the plumb line to the desired measure. Draw another parallel plumb line using the square. That is the end of your rafter. The size of the facia determines the depth of the rafter end. Use the square to measure down the end plumb line the thickness of the facia. Draw a horizontal line (90°) from the desired facia thickness toward the birdsmouth. Cut the 90° angle to form the rafter end. You now have a pattern for all common rafters. If the rafters tie to a ridge board, mark it and the top plate of the support walls with the spacing. Nail one rafter at the ridge board, and then toenail the opposing rafter into place. Work your way along the ridge installing the rest of the rafter pairs. Align the birdsmouth at the mark and toenail it into place. Space the rafters or trusses at 16” centers, align them over the studs of the support walls. This will help the wall better carry the roof load. Use 10d or 16d nails to toenail the rafters into place at the top plate. I usually add hurricane ties too as added protection from wind force. It adds to the cost but can make a difference when needed. A ridge beam is thicker than a ridge board, so nailing through it into the rafter end isn’t an option. Toenailing from both faces of the rafter into the beam is one option but makes keeping the rafter lined up difficult. Rafter hangers are another option for attaching rafters to a ridge beam. Attach the hangers to the beam at the required spacing, and then attach the rafter to the hanger. Nail using 10d or 16d nails or use Simpson Strong-Tie fasteners designed for structural brackets (my preference). Framing the roof using trusses instead of rafters is another option. They can be manufactured or pre-made, or you can make your own. To make trusses draw up a truss plan or find one online or in print. I like the challenge of drawing it up; sometimes it’s easier if the shed is an odd size or shape. Cut all the components for one truss, including the gussets to hold it together. Tack the pieces together and ensure it fits – adjust if necessary. Disassemble, and use the pattern pieces to lay out and cut all components for all the trusses. Assemble trusses using ½” plywood gussets using 6d spiral or ring shank nails. Lay the trusses on top of each other to make sure they are all the same. Lift the trusses onto the top plates, space them as planned, and secure them to the wall plates. Toenail the trusses to the top plate using 16d spiral or ring nails. Or fasten the trusses to wall plates using hurricane brackets with 10d nails or Simpson Strong-Tie fasteners. Build the gable ends so the top plate is 1½” side overhangs lower than the top of the truss. Cut 2×4 lengths to nail to the last truss, go over the gable end, and extend out to form the eaves. Nail the fascia board to the ends of the 2×4 roof extensions. There are a variety of metal brackets on the market. Many are good, but some are better. My preference is Simpson Strong-Tie fasteners and structural brackets. They’re readily available and come with a good guarantee. Plywood or OSB are both fine for sheathing a roof. The thickness minimums are in the building code. I use 5/8” for 16-inch centers and 3/4” for 24-inch centers. Block or strap the rafters if they bow laterally. Use tongue and groove or H-clips between trusses/rafters. Start at a bottom corner and work along the roof with full sheets across the rafters or trusses. Use 8d or 10d common nails. Offset the second row by half a sheet and finish the roof. Cut a sheet to fill in the row ends. Remember to leave space at the ridge for ventilation. Make sure to check out my post about what type of plywood to use for a shed roof. Roll out the first row of felt and staple in place or use self-sticking roof guard. Start at the edge of the sheathing. Overlap the next row and continue till the roof is covered. Use stainless steel staple or the self-adhering roofing. The drip edge is nailed in place using 3/4” or longer shingle nails. It goes over the felt on the gables to prevent windblown moisture getting under the felt. At the birdsmouth end, it goes under the felt. Overlap the sections of drip edge too. Start in the lower corner and follow the manufacturer’s instructions. The first row of shingles is rotated, so the tabs are going up roof and overlap the drip edge by 3/8”. Use 1-¼” shingle nails 6-inches up from the drip edge to fasten into place. The second row covers the first row totally with the tabs covering the drip edge. Each row is offset by 1/3 of a shingle. Sounds like an article for another day! Hope you found this article on framing a shed roof useful. Let us know what you think. If you know someone who might find this article useful, pass it on.